Citation Information: J Clin Invest. 2014;124(2):696-711. https://doi.org/10.1172/JCI71472. The mechanisms that regulate the strength of synaptic transmission and intrinsic neuronal excitability are well characterized; however, the mechanisms that promote disease-causing neural network dysfunction are poorly defined. We generated mice with targeted neuron type–specific expression of a gain-of-function variant of the neurotransmitter receptor for glycine (GlyR) that is found in hippocampectomies from patients with temporal lobe epilepsy. In this mouse model, targeted expression of gain-of-function GlyR in terminals of glutamatergic cells or in parvalbumin-positive interneurons persistently altered neural network excitability. The increased network excitability associated with gain-of-function GlyR expression in glutamatergic neurons resulted in recurrent epileptiform discharge, which provoked cognitive dysfunction and memory deficits without affecting bidirectional synaptic plasticity. In contrast, decreased network excitability due to gain-of-function GlyR expression in parvalbumin-positive interneurons resulted in an anxiety phenotype, but did not affect cognitive performance or discriminative associative memory. Our animal model unveils neuron type–specific effects on cognition, formation of discriminative associative memory, and emotional behavior in vivo. Furthermore, our data identify a presynaptic disease–causing molecular mechanism that impairs homeostatic regulation of neural network excitability and triggers neuropsychiatric symptoms. The vesicular trafficking factor SEC8 is a new interaction partner of GlyR α3L and allows axonal receptor expression. (A) Proteins interacting with GST::α3L in the presence of adult mouse brain lysate were excised and analyzed with mass spectrometry. Supplemental Table 1 provides a list of significant hits. (B) Western blot with an SEC8 antibody confirms the cosedimentation of SEC8 with GlyR α3L and identifies the spliced exon 8A coding for TEAFALEKFYRFSDT of GlyR α3L as the SEC8 interaction domain. Equal GST bead loading with α3K- or α3L-loops was verified with Coomassie staining (B, left panel). (C) SEC8 bound with the GlyR α3L TM3-4 loop in HEK293 cells. The GlyR α3 TM3-4 loop harbored an intrinsic NLS, which led to the translocation of SEC8::EGFP to the nucleus of HEK293 cells upon coexpression of the α3L-loop. 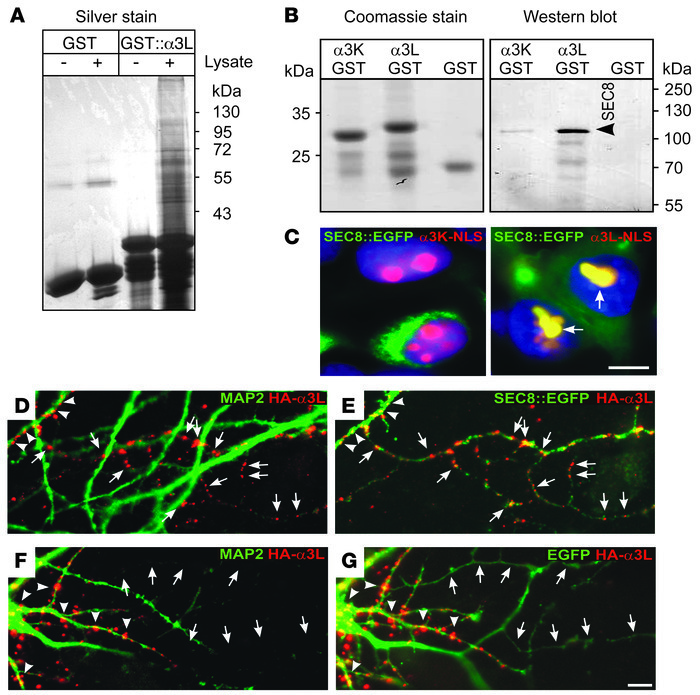 (D–G) To investigate the role of SEC8 in subcellular GlyR α3L trafficking, primary hippocampal neurons were cotransfected with HA-tagged full-length GlyR α3L and SEC8::EGFP or EGFP. Arrows indicate the presumptive axonal compartment devoid of MAP2, and arrowheads point to the somatodendritic MAP2-positive compartment. Note that SEC8::EGFP coclustered with GlyR α3L in the MAP2-negative compartment, an activity that was not observed upon coexpression of EGFP. Scale bars: 10 μm (C), and 5 μm (D–G).